Greetings all! I have been very quiet on here for the last few months, first there was Christmas then recovery from an operation, but I’m back in the studio now and I’ve been working on a few new pieces. I need to have a day of photographing to have some more pictures to share with you all, but this is my latest creation, completed just a few days ago and inspired by the Swedish folk tale of Princess Cottongrass and Leap the Elk. 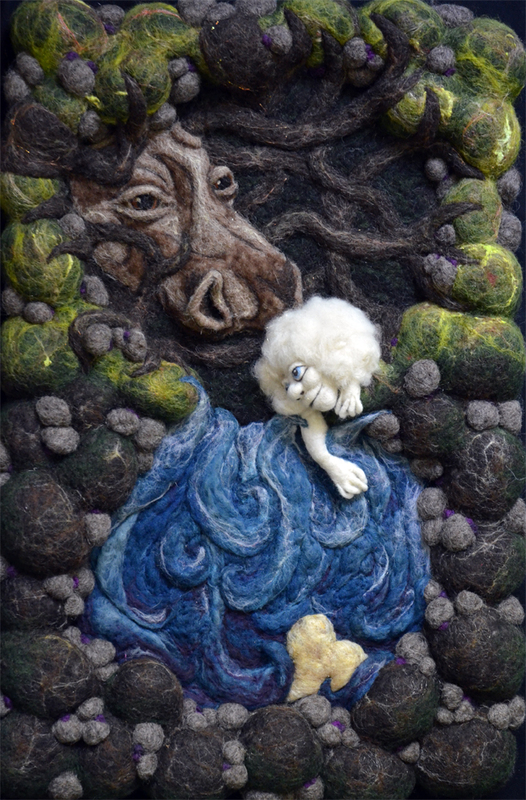 This piece measures 40x60cm and is entirely needle felted. Edit: I had the wonderful David Robinson photograph some of my work yesterday, so I have updated the picture with a much better quality one that he took.